So The Mythbusters Punched A Hole In A House With A Cannonball. Now What? Mythbusters has tried out a lot of things in the last few years, but trying a cannonball fired through a residential neighborhood? That was an accident. So The Mythbusters Punched A Hole In A House With A Cannonball. Now What? 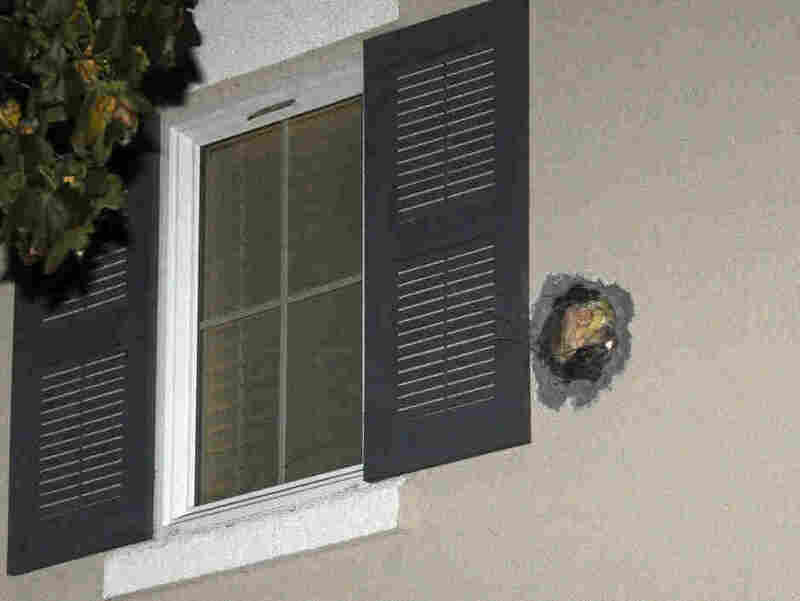 The exit hole from a misfired cannonball is seen in the second story wall after it traveled through a Dublin, Calif., home on Cassata Place on Tuesday, Dec. 6, 2011. That's the question that naturally arises after one of the most startling stories to come along in entertainment news in a while: during the filming of Mythbusters, the show fired a cannonball that went off-course and flew right through a residential neighborhood, punching a hole in a house and eventually hitting a parked car. Nobody was hurt, but quite frankly, that's just good luck at work. Now: The show wasn't just firing cannonballs willy-nilly at people's houses. That's not how they do things. They were at the Alameda Sheriff's Department bomb range being supervised by a trained bomb technician. According to a statement from Discovery, the cannonball "took an unforeseen bounce from a safety berm." Remember, they've been in production for years, and the worst thing to happen before now was underestimating the force of an explosion and breaking a window or two. There's a reason they've done so much for so long with so few problems. Unfortunately, that instantly becomes a very hollow fact indeed, because the number of cannonballs it's acceptable to blow through people's houses for the sake of entertainment is not in dispute, and it is zero cannonballs through anybody's house, ever. And everybody associated with the show knows it, and you know they know it. Even were they inclined to make excuses, excuses would be hard to come by when everybody agrees that ... yes, that was their cannonball that flew through the neighborhood. They will pay for all the damage, they will pay for the trouble, and they may well pay quite a lot. But what then? Savage tweeted this morning that the show is still in production, and that rumors that it was suspended are inaccurate. But that doesn't mean everything is status quo, of course. But when you hear that a 30-pound cannonball flew 700 yards beyond the bomb range — a 30-pound cannonball flew 700 yards outside where it was meant to be — and when you read about its path through the neighborhood, through a house, across the street, off a roof and into a car, you're reminded that they're working with a tremendous amount of force. It raises the reasonable question of how big experiments can get and how much power they can involve before the risk of freak accidents isn't worth it, no matter how freaky they are. Savage has already said there will be no more cannons at the bomb range, but we'll have to wait and see whether anything scales down, or just changes location. Moreover, while they have a lot of expert assistance and advice, it's interesting to ponder what kind of expert you get for a cannon. I'm confident the Sheriff's Department has experience with bombs and guns; I don't know how much they have with cannons. Of course, ideally, they'd figure this out transparently, on the show. Bear with me — let us imagine a world in which no one worries about being sued, either now or in the future, and therefore, you don't have a reason not to talk about your own mistakes. Just imagine it. You know what would make a great investigation? What in the love of little chicken feathers happened here? Ironically, this is exactly the show that could theoretically explain with great clarity what went wrong and how you make sure it never happens in the future. Maybe one factor or another behaved differently than expected. I mean, clearly, something behaved differently than expected, and that's exactly what this show does. It figures out what's going on when things react with the physical forces of nature in ways that aren't intuitive. Savage tweeted that after touring the damaged area, they were heading back to base in San Francisco to figure out how to make sure it never happened again, and I bet those conversations will be fascinating. It probably can't happen, but boy, I would watch the heck out of that. You don't want to wind up testing foam balls thrown at pillows. You don't want to be limited to figuring out how long it takes chocolate syrup to dissolve in milk. Unleashing some physical force is a big part of the show's charm, and in fact, getting people to respect the amount of power that's unleashed by things like explosions and fires is one of the objectives. They may have achieved it just a little too well in this case.